Daft Punk have always had an obsession with anonymity. In fact, their penchant for nondisclosure predates their iconic helmets to their early days in the 1990s performing with various novelty masks. Something happened around the turn of the millennium, however. With their new album Discovery on the horizon, Guy-Manuel and Thomas became infatuated with the idea of becoming robots. The concept led them to Tony Gardner and special effects company Alterian Inc, who developed their now legendary helmets. 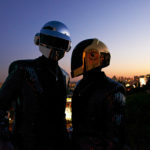 Since that time, Daft Punk’s helmets have become their aesthetic signature. As such, fans all over the world have sought to recreate the prop. Few, however, have done so as expertly as Missouri’s Greg Santacruz. Watch his entire process below, as documented in photos by Tim Bottchen.